Somehow available to the resource AutoBlog got drawings, in which a model is presented chetyrhedvernaya famous roadster Mercedes SLS AMG. Had the Germans decided to add another car using the current platform. Drawing is a combination of conventional doors, the "wings", a small rear poludverey and the lack of a central pillar. 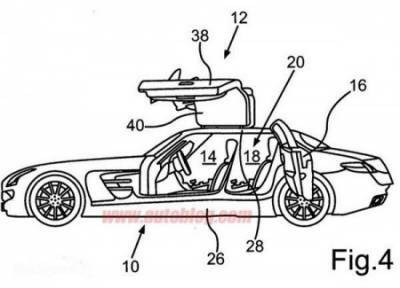 The documentation also says that the Mercedes engineers intend to focus all their attention on reducing vehicle weight and maintaining rigidity. In addition, the car will receive an increased wheelbase. Many representatives surprised the company was asked to share AutoBlog Mercedes officially comment on this image. And the answer was almost nothing, "we do not take it upon myself to share comments regarding our future products." At the same time representative of the Mercedes refused to deny these materials.